Have you ever worked so hard and long on a project that you feel like you just gave birth to a new baby? Yep...meet D. Spelling, my new baby, at just over 300 pages long! Let me take you through a little tour of how I use this in my classroom. 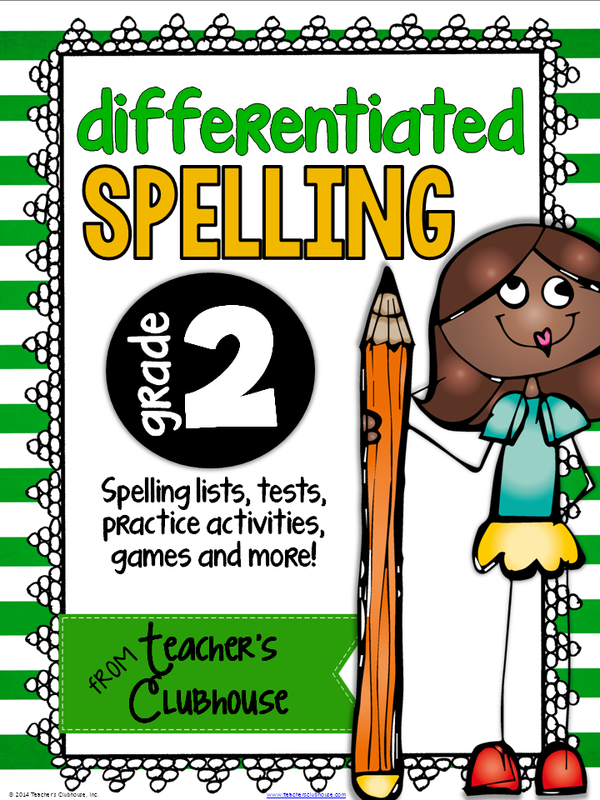 It took my years to figure out how I could differentiate spelling in my classroom in a way that I could manage easily. Maybe it will help you out, too! Every Monday, I give my students a pretest (template included). Students who earn 80% or higher on the pretest will study List B words for the week, all other students will study List A words. The great thing about my word lists is that List A and List B follow the exact same pattern. This makes it super easy for me to teach whole-group mini-lessons on the pattern that all students can apply to their word lists. Each word list has 10 words and then all students have a common 5 words for the week, for a total of 15 words to study. After our pretest, I pass out our word list card for that week. Students highlight their word list and attach it to their metal ring. This ensures that students have all words for the year for constant review. I do not want students to just memorize their words for the week and then forget them. We are constantly reviewing our past words through games and activities. In fact, once per quarter, I give a "random sampling" test (template included) where I randomly pull 20 words from past lists to make sure students are internalizing these patterns instead of "get and forget." 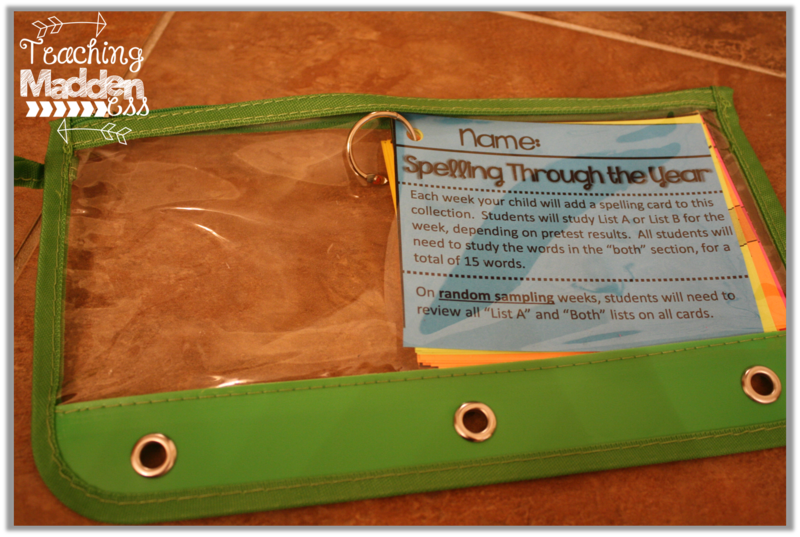 Having the words on these cards also ensures that students always have their spelling cards with them. If they need their words for homework, for class activities, or to study at daycare...no problem, they have them at all times! My students keep them in a pencil pouch that resides in their daily take-home folders. The biggest challenge with differentiating (to me anyway) was actually giving the spelling test! How in the world could I give multiple tests at once?? I've heard of teachers letting children give the tests to each other and, maybe I'm too controlling, but I knew that just wouldn't work for me. 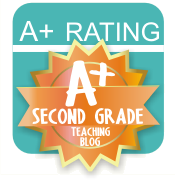 My format uses several different formats to meet the needs of all learners. It also allows me to administer different tests at the exact same time! The first half of the test is the same for everyone...and this is the part that the teacher calls out. First, there's the "choice" section. This section is just that - teacher's choice! You can use this section for word wall words (existing ones you use, or we've included some for you that coordinate with our lists!) or for content words (like names of shapes during a geometry study) or transfer words. Transfer words are my personal favorite. 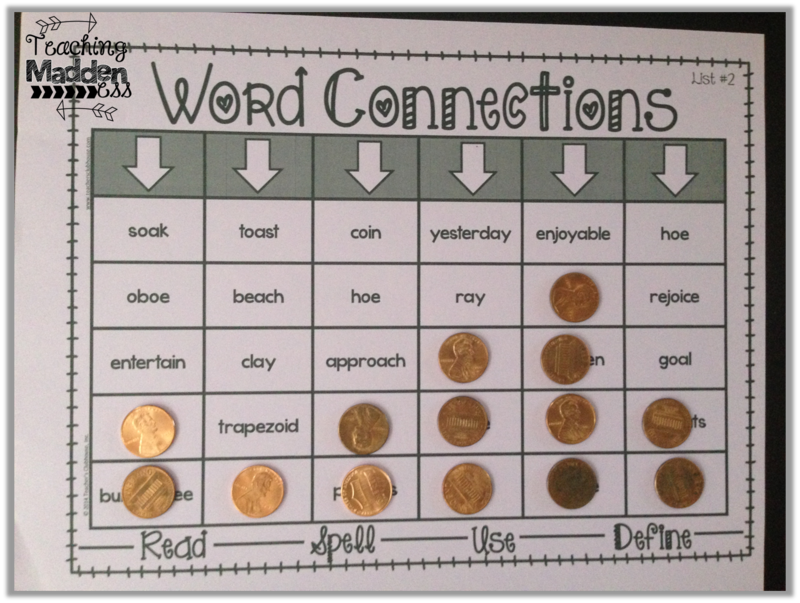 They ask students to take the weekly pattern and apply it to new words. We've included transfer words (and prompting) for you if you'd like to use that option! The second part of the test is the "traditional" format. The teacher calls out 5 words and students write them. These call out words are the 5 words from the "both" list so that all students complete this section at the same time. The bottom half of the test is where the differentiated lists come into play. First, students must read a sentence, locate a misspelled word and write it correctly in the box. We included multiple words with the spelling pattern in the sentences so that students aren't able to just look for the pattern...we really want them to use their "eagle eyes" and edit which always proves a little more challenging. 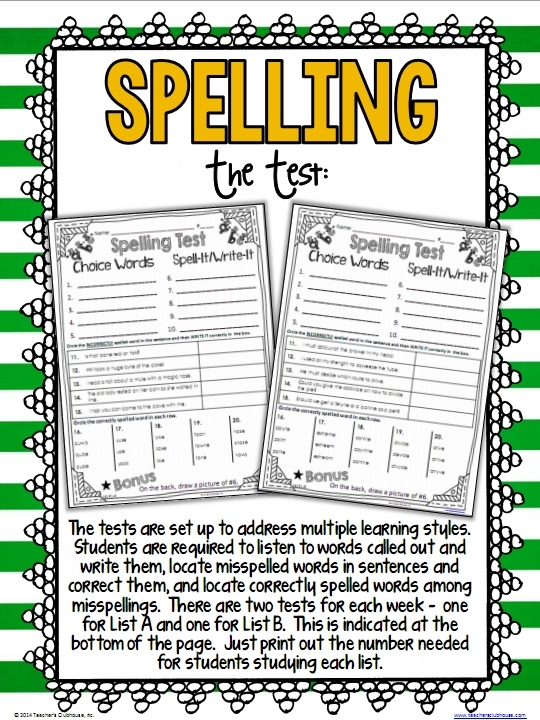 The last section of the test gives students multiple spellings of a word and they have to circle the correct spelling. This is often how students will be tested on spelling on standardized tests so it proves to be great exposure and practice. This packet is a 30 week spelling program. It contains 26 weeks of lists (that's 52 word lists in all!) and has 4 weeks built in for "random sampling" which makes a 30 week program. We've even included the time table of how we implement the program to help you out. But that's just the "meat and potatoes" of this pack! We've also included a lot of sides to go along with it. One thing that I do every Monday after the pretest and a little mini-lesson on the pattern is a word sort. Students complete their word sorts in their word study journals (composition notebooks). 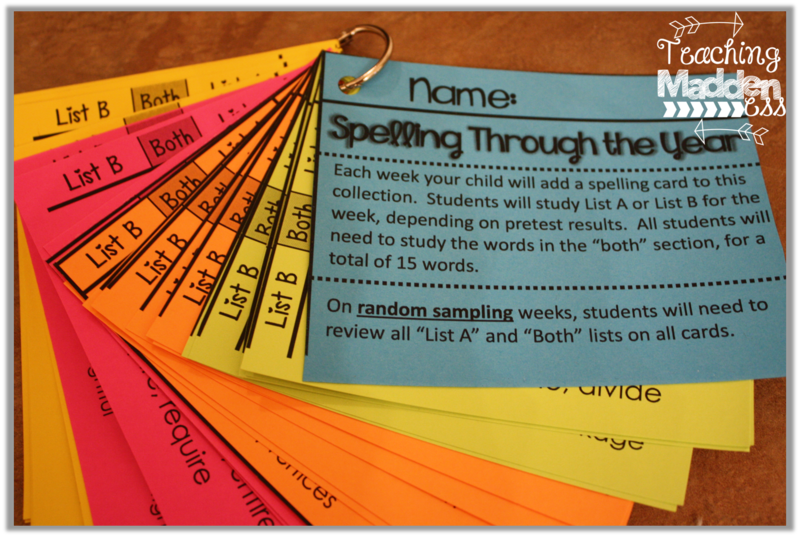 Once they're sorted, they will highlight the weekly patterns and glue the words down. Each week the sorts will look a little different depending on the patterns. The rest of the week, we will spend time each day exploring this pattern. Students will be exposed to a ton of words (not just their list words) to help them cement this pattern into their learning. 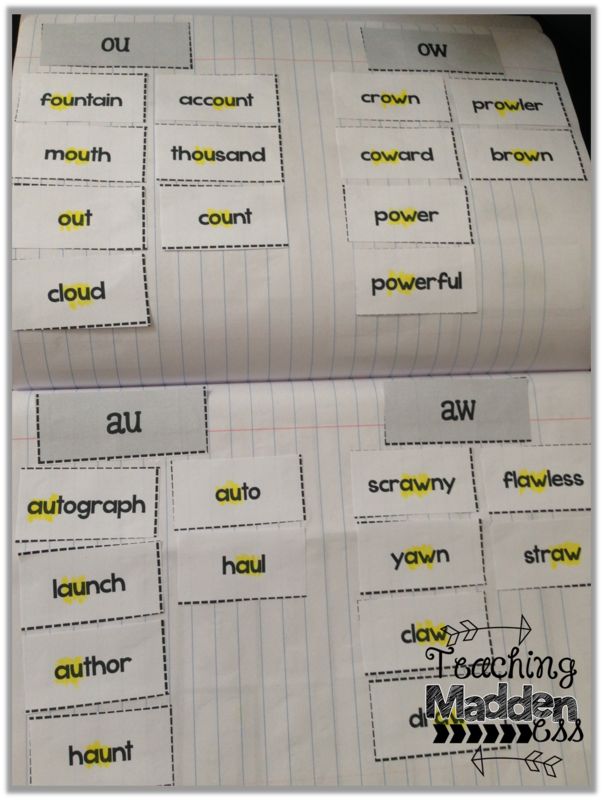 We do many of the typical activities to practice words; however, I'm not a big fan of activities such as "use each word in a sentence" or "how many words can you make from this word" for our spelling practice block. Yes, those activities have importance, but I like to keep the focus on spelling during spelling because we only have a very short block. 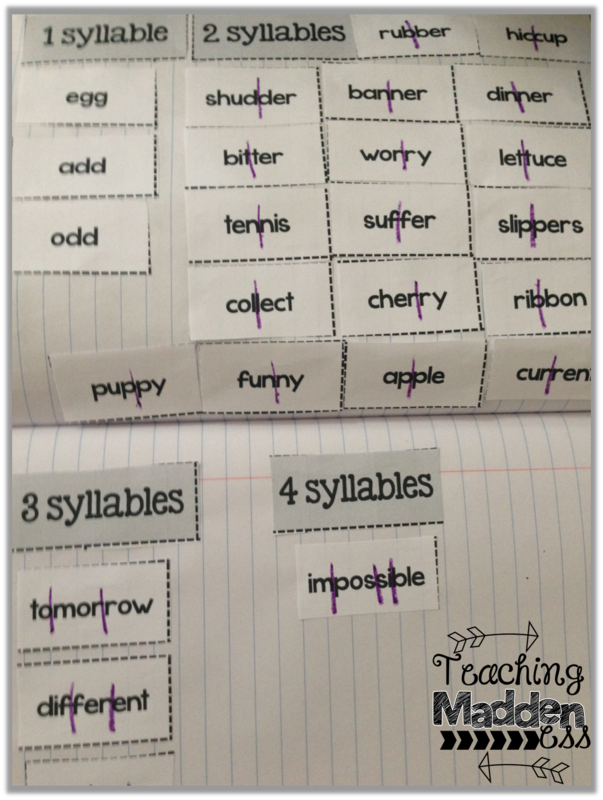 Here's a peek at some of my favorite spelling practice activities that I included for EACH word list in this pack. 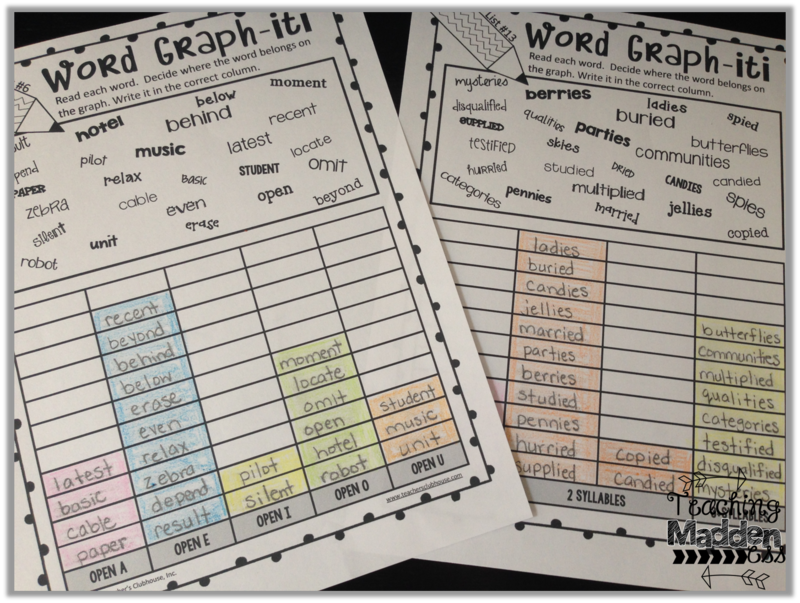 Word Graph-iti is another activity I adore! It has students read the words in various fonts (such an important skill in this tech savvy world!) and then sort the word by writing it above a category label. Yep, reading, writing, and thinking about the words - all important components of learning to spell the word. But then, their sort makes a graph so it makes integrating some math questioning super duper easy! I LOVE when I can knock out two standards at once. I also included cursive practice pages for all lists. I know we aren't required to teach cursive anymore, but let me tell you....there are TWO things second graders WANT to learn - multiplication and cursive. They beg for it. 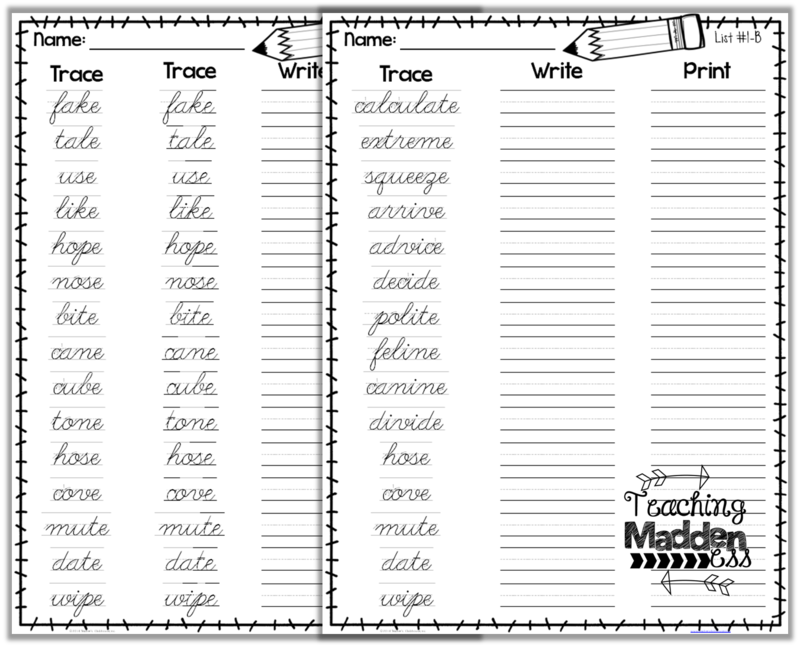 So, I will laminate these pages and use them in centers or for early finishers to practice their spelling (or review past words) with cursive and print. Anything to make them love practice, right?! And to wrap it up, I include a spelling menu that I use as a homework option. You can read more about my spelling homework in my homework series HERE. The packet includes a 15+ page overview to explain all of this in a little bit more depth. If you're interested you can find it in our shop at Teacher's Clubhouse. AND it is 50% off for the first 24 hours, so what are you waiting for??? You did put it in a lot of work! I would love to purchase this pack, but we have spelling words tied to our reading program. I wish you had a similar pack with less "meat" and just "potatoes" lol. 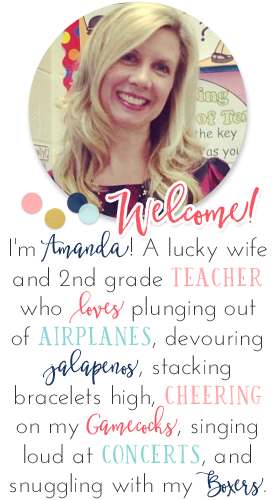 Wow, Amanda!!! What a labor of love! I really like how the weekly tests have multiple opportunities for students to apply what they know. 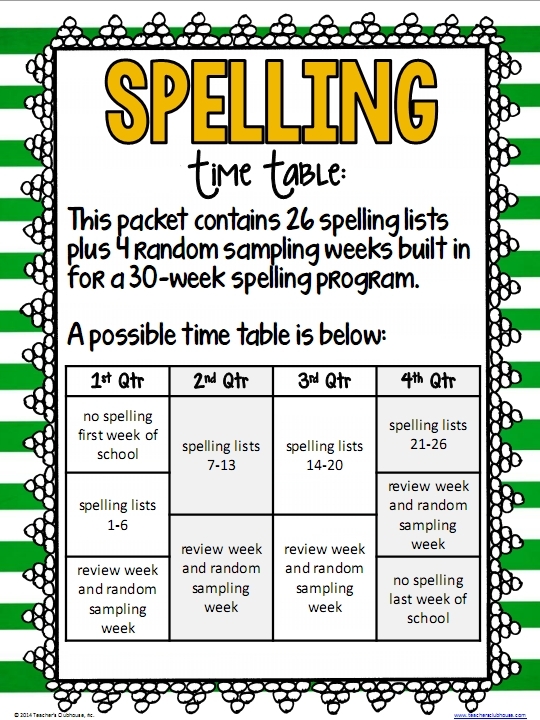 Do you have a list of which spelling concepts each week covers? I am currently using Words Their Way, but may be interested in switching it up! OH man I love this!!! I am def. pinning to show to my team next week. I would buy it now if it was up to me! This is just what I have been looking for. Looks awesome!! My kids would love to use all those games and practice pages! I am also wondering which spelling concepts you cover over the 30 weeks. A list would be great if possible. This is exactly what I have been looking for. Thank you!!!!!!!!!!!! Where do you get your pencil pouches from? I LOVE this packet! I do have a few questions after looking at the packet sample on TPT. I am sure that the whole packet has the answers, but I was curious. On page 4 of the sample, it says WW and T on the left had of each spelling list. What do the WW and T mean? Also, when do you use the transfer sentences? On the test pages- are the "Spell-it/write-it" blanks 6-10 where ALL students would write the words? Thanks so much for all of your hard work! I am new to 2nd grade and am not thrilled with the spelling program our district uses. This looks so fabulous! Yes, we included an in-depth overview in this packet that will explain each of the sections in detail. The WW stands for word wall and the T stands for transfer - in the "choice" section of the test these are two options that teachers may want to choose from to meet their students' needs. If the teacher chooses to use transfer words in this section, she would read the transfer sentences on the test. Yes, the Spell it/Write it section is where the teacher will call out the five words from the "both" list for all students. WOW! After reading this, I want to completely change how I teach spelling. Thanks so much for sharing this. These concepts look very similar to what I teach in 3rd... is this packet strictly for 2nd or is it something I could use in 3rd? I have had many 3rd grade teachers tell me they have used this with success! I would imagine you would have more on list B than I do in 2nd grade, but I think (and hear) it still works! 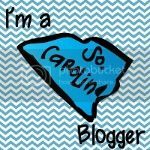 Are the lists editable to make them longer?